California-native Bobby Matos helms the kitchen at State of Grace, James Beard Award-nominee Ford Fry’s first foray outside the Atlanta area. Drawing on nostalgia, Matos creates classic, American fare inspired by the Texas hill country, with a heavy Texas Gulf Coast experience. 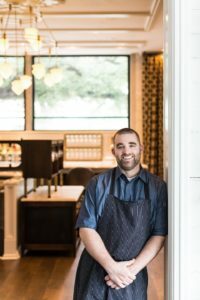 He marries that theme with his masterful technique, simple approach, and locally-sourced ingredients as he leads the State of Grace team. With humble culinary beginnings in place, Matos went on to study recreational administration at California Polytechnic State University, when he realized it was the restaurant industry and learning new cooking techniques that made him come alive. Upon graduation, Matos spent time spent backpacking and dining through Europe, from Greece and Switzerland to Hungary and Italy. After his travels in Europe, Matos enrolled at the Culinary Institute of America in New York to begin his professional training. “Culinary school is a lot of what you make it,” he said. “I was lucky enough that the majority of my group was older and serious. I really got to know them.” Matos completed his externship at Pinot Blan in Napa Valley, California, and staged at Thomas Keller’s famed French Laundry. Matos went on to serve at New York restaurant Beveldere Mansion, and worked in California at Georges at Cove under Tre Foshee, a FOOD & WINE Best New Chef. “They were among the first to bring the concept of farm-to-table in: they ushered in the idea of bringing in product straight in – skipping the cooler – and starting to cook it,” Matos said. “I grew to love that, seeing the relationship between farmers and guiding menus.” After New York City stints as sous chef at The Modern and Alto, Matos moved back to the West Coast, working as a private chef in San Diego, where he met his wife. The couple moved to Texas, and Matos was tapped as executive chef of Tony Vallone’s Ciao Bello. Under his expertise, the restaurant was awarded the Houston Press nod for city’s Best Italian Restaurant, and food writer Katilin Steinberg named Matos’ Pastiera di Mare – a traditional, Neopolitan dish – to her 100 Favorite Dishes list in 2014. As Fry set his sights on venturing into his hometown, he reached out to Matos, who bonded with Fry over beers during one of Fry’s trips to Houston. The two were a match regarding restaurant philosophy: great food, great service, and a lot of attention to detail. Fry recruited Matos to open State of Grace in fall of 2015. The restaurant focuses on house-made product and utilizes the open-hearth wood grill as the centerpiece of the restaurant, employing it for all aspects of the menu. When not in the kitchen, Matos, his wife, and two kids reside in the Memorial area of Houston.